I’m sorry it’s a longer post than I’d usually share but stay with me on this one. So you’ll know by now that M.E. impacts every area of my life. It’s just a spoilt brat like that. You’ll probably also know that it impacts my entire body. I thought I’d got my head around this until a new ‘symptom’ took me by surprise. Last year I noticed that it took me an unusually long time to form scabs after I’d cut myself shaving or whatever. I’m talking days. I ignored it and slapped the plasters on and it wasn’t until I mentioned it to my nutritionist friend that I went to see my GP. I wish I’d been proved wrong this time. I can’t tell you how disappointed I was. Yes. Disappointed. My newish GP gave me hope by referring me to a haematologist. Afterall, it isn’t normal to bleed like I was. This GP even retested my blood when the first results came back clear. She believed me when I said I couldn’t stop bleeding. Ironically, when they took my blood each time, they struggled to get my arm to stop bleeding. Those second results, taken on a poorlier day, came back dramatically low in Factor 8. I was told by the haematologist that I was being tested for von Willebrand Disease but as there was no family history of blood disorders there was a small possibility that I had ‘acquired von Willebrand disease’. The haematologist took yet more blood samples. Those came back ‘healthy’. I was discharged and told I didn’t have von Willebrand; that a blood disorder was something I didn’t need to worry about. Each time, you come away from an appointment with more questions than answers. That chips away at your ability to keep fighting; to not just give up and surrender to a life of THIS. There is only so much a person can take. And for a fleeting moment I wonder whether I should just surrender to sleeping all day every day and not bothering with. What’s the point? Recovery from illness should be a group effort, not an individual one. When I said I wanted to be independent this isn’t quite what I had in mind. There should be doctors and support teams. 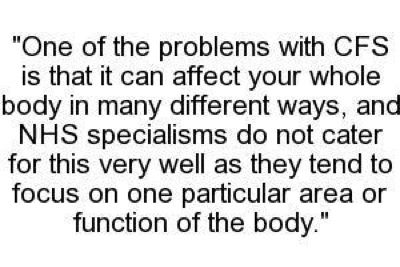 I sometimes mention the CFS clinic but I am not officially on their books anymore. They keep you for six months and I just happened to be re-referred during a setback by a doctor who didn’t understand about M.E. I burst I to tears as soon as I got back to the car. I felt bruised with disappointment. I admit I wanted a name or diagnosis for what’s been going on so I could say “look what M.E. has done to me,” and it would maybe help persuade people that this is physical, so much so that it’s ruined my blood. can the results possibly be clear? You should have seen the list of tests my GP sent me for when I first mentioned this blood thing. LOTS. I do not have the energy, and I think I am running out of fight, to pursue every frightening symptom that rears its head. I just want someone to take me seriously and not pass me from pillar to post because I don’t come under their jurisdiction.